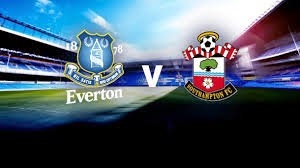 Everton faces Southamton in this match . Home team is in the safe zone with 30 points 9 away from relegation zone . are doing good with 2 wins in last matches . In the other side Southampton in sixth place fighting for in place in the euro zone . Wil be a very hard match but i expect both teams to score at least one goal . Both teams have good strikers so they wil show their class in this match . in this match can be a close result 1-1 2-1 or 1-2.